Thank you for your interest in our elk / deer combination hunts. We offer premium guided hunts in the Big Belt Mountains of Central Montana. 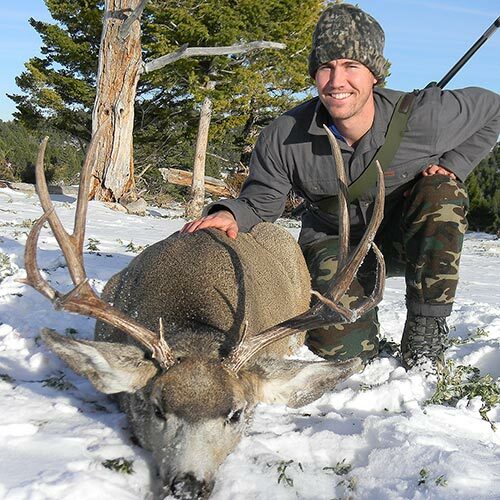 Our goal is to provide enjoyable, top quality hunting trips for Elk, Mule Deer, Whitetail Deer and Antelope. All hunts are fair chase only. We are located in the Big Belt Mountain Range northwest of White Sulphur Springs, MT, area number 446. We hunt 4 private ranches totaling 46,000 acres for elk hunting. These ranches include 7 main drainages, the largest being Beaver Creek and Elk Creek. The ridges and south slopes are covered with scattered timber and numerous basins. Elevations vary from 4,650 ft. to 6,900 ft. The tops of these ridges offer miles of open parks and benches where much of our hunting takes place. The north slopes are steep with heavy red fir, lodge pole pine, and quaking aspen timber for cover. In the 2015, 2016, and 2017 rifle seasons, 62 elk hunters harvested 38 bulls and 4 cows for a 67% success rate. 5 seven points, 22 six points, 10 five points, 1 four point and four cows were taken. 10 whitetail bucks, 2 whitetail does and 19 mule deer bucks were also taken, including 2 seven points, 2 six points, 13 five points, 7 four points, 4 three points, 1 two point and 2 does (western count). 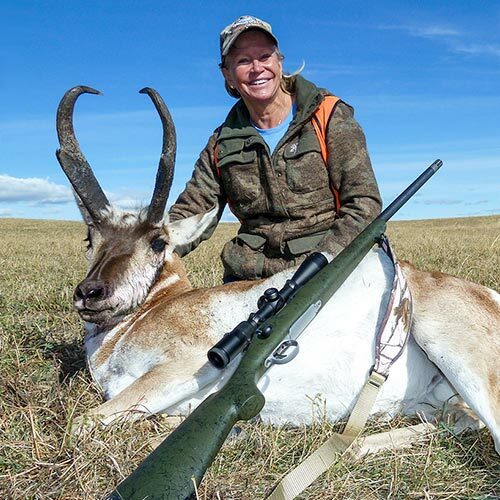 13 buck antelope and three doe antelope were also taken, all ranging from 12” to 14” in horn length. 16 bulls, 5 bucks, and 3 antelope were shot at and missed. Shots were also passed up at 68 bulls and approximately 80 bucks. In the 2018 season, 17 elk hunters collected 13 bulls and 2 cows for an 88% success rate. 8 six points, 5 five points and 2 cows were taken. 1 mule deer buck and 10 whitetail bucks were also taken. They included 7 five points and 4 four points (western count). 1 bull elk, 2 whitetail bucks and 1 antelope buck were shot at and missed this season. Our rifle hunters also passed up shots at 3 bull elk, 10 mule deer bucks and 25 whitetail bucks. 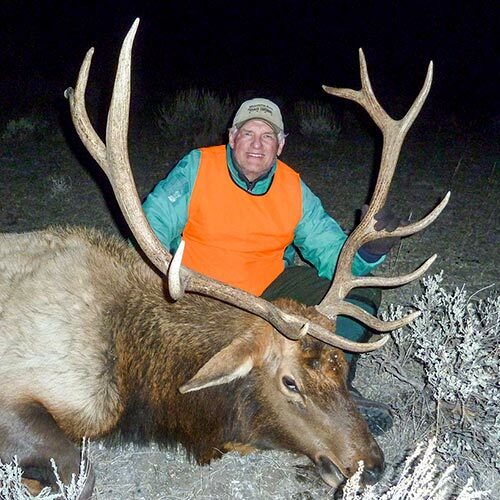 Hunters averaged seeing a minimum of 125 elk per week/per person, including 8 to 12 bulls. All hunts are 6 full days of actual hunting. We run both 1 guide for 1 hunter and 1 guide for 2 hunters with 4 hunters a hunt maximum. 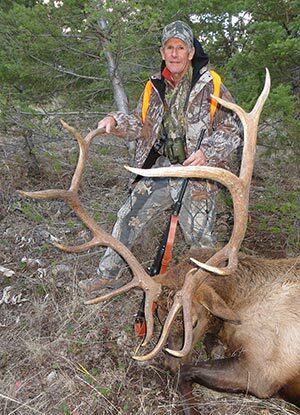 You will enjoy the vast amounts of hunting country the ranches offer throughout the week. The ranches do not allow public hunting or road access. Our crew and the ranch crew are the only exceptions. We run approximately 350 head of resident elk. These elk calve, summer, go through the rut and winter on the ranches. The cow-calf ratio averaged 32% over the last 3 years with a 7 cows to 1 bull ratio. A good flow of elk also travel on to the ranches during parts of the hunting season due to hunting pressure around us. 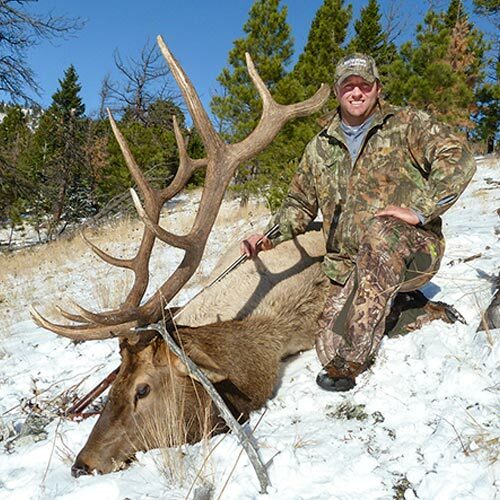 The weather, other than extreme conditions, is not a deciding factor in our elk hunting. Our success is not greatly affected by 60 degree weather, nor do we depend on heavy storms and migration to move elk into our area. November snows do improve hunting, triggering the deer rut, concentrates the elk more, and makes tracking and spotting a lot easier. These elk do not migrate, spending late fall and early winter in high, secluded parks and timbered ridges where hunting pressure is minimal. These ranches offer 72 sections of this type of country, giving the option of letting some hunting country rest from week to week, and being a major key to our success rate on good bulls. Most of our hunting is done by glassing, spotting elk feeding at first light, and then stalking to within shooting distance. If we have no luck spotting at daylight we still hunt slowly around edges of parks, benches, and fairly open ridges. In the evenings we set up where elk or tracks were seen that morning, waiting for them to feed into us or feed to where a stalk is possible. Due to the amount of open country we work in on the elk only when you have a chance of getting close, clean shooting. You always have the option of passing up bulls due to size or difficult shot placement. The mule deer hunting is done similar to the elk hunting, glassing, spotting, and then stalking to within shooting distance. The mule deer bucks that we are taking are 22” to 26” bucks. The mule deer population is increasing and the Camas Creek Ranch offers some good late season hunting. There are approximately 11,000 acres of river bottoms included in the elk leases that have some deer hunting in addition to the elk hunting. It supports an estimated population of 350 whitetails. We do some still hunting and a lot of sitting for the whitetails. Natural ground blinds are used and will be set up pre-season. We also use portable hay bale blinds and tree stands as needed. Hunters are seeing 15 to 30 deer per day, including 4 to 8 bucks in the river bottoms. This is included as part of your hunt and used later in the week after you have collected an elk. The ranches are fairly rugged with a lot of high parks and ridges. This is fair chase elk hunting in mountainous terrain. Weather and wind conditions, changing game patterns and hunter ability are beyond our control. You need to be well prepared and in good physical shape for this hunt, as we hunt hard to find the best bulls the ranches offer. We cannot guarantee an elk but give our 100% best efforts. 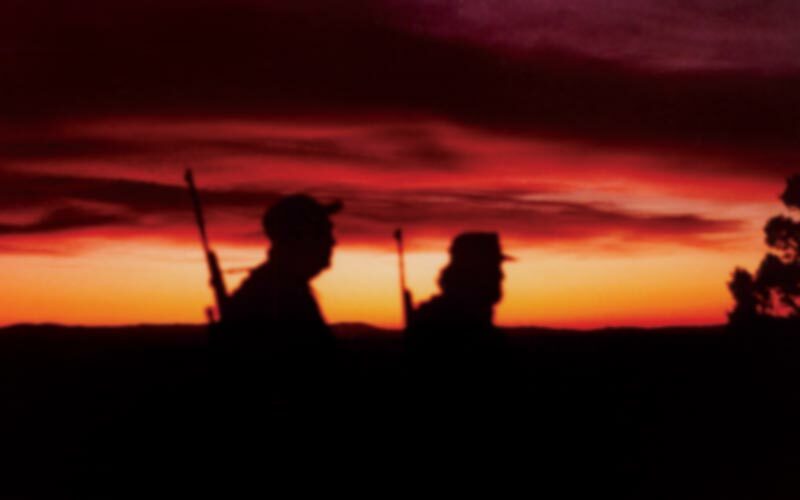 Our goal is for you to have an enjoyable, successful hunt. The guides that help us are kind, courteous, seasoned hunters, and realize the importance of slow, quiet hunts. We also have an excellent full time cook. 4x4 vehicles are used for transportation to and from hunting areas. This amounts to 15 to 60 minutes of traveling before daylight to get into good hunting. They are also used during the day if we move to another hunting area before evening. Lunches are packed with us daily. We are able to drive into the camp, which is located 23 miles northwest of White Sulphur Springs on Beaver Creek. One large cabin is used for storage and cooking. Four 12x16 cabins are used for living quarters, 2 hunters per cabin. They are furnished with beds, mattresses, 15,000 BTU propane heaters, propane lights, table, chairs, drying racks for boots/clothes, and gear storage. These cabins are well constructed, very warm, comfortable, and well winterized. A barn is used for hunting gear, feed, and hanging meat. All food, guides, equipment, and accommodations are furnished. You will need to furnish your motel rooms and transportation to White Sulphur Springs, Montana, before and after your hunt, hunting license, rifle, sleeping bag, personal gear, meat processing, and taxidermy costs. There is a butcher and taxidermist in White Sulphur Springs that can take care of your processing, shipping, and taxidermy needs, and are reasonably priced. We prepare all hides, heads, and capes for mounting. I will help you as much as possible on your travel arrangements. Transportation will be provided whether you drive or fly. Reservations are made on request. Helena is the closest commercial airport with White Sulphur Springs being the closest town. We suggest a 270. caliber rifle or larger with a minimum of 130 grain bullets for elk. 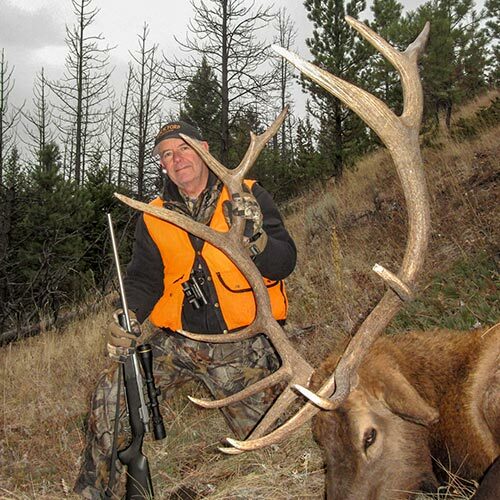 In the Big Belt Mountains (area 446) a bull elk must have brow tines to be legal. We also ask you to not shoot any buck deer 3 points or under (western count) on these leases. We have had good results with this type of management and with your cooperation will continue to do so. I am often asked the advantages/disadvantages of early hunts versus late hunts. In the early weeks elk will be spread out more on the ranches. Some of the bulls are still with cows and more vulnerable. The elk have not been hunted a lot and are easier to locate and walk to. The weather is warmer as a rule. The deer rut has not started yet and big bucks are hard to find. As the season progresses many of the bulls will be alone or in small groups away from the cow herds. The elk will feed more during daylight hours due to snow and colder weather. We have had several weeks to hunt and glass the ranches and find where groups of bulls are staying. November snows also help locate and pattern bulls. 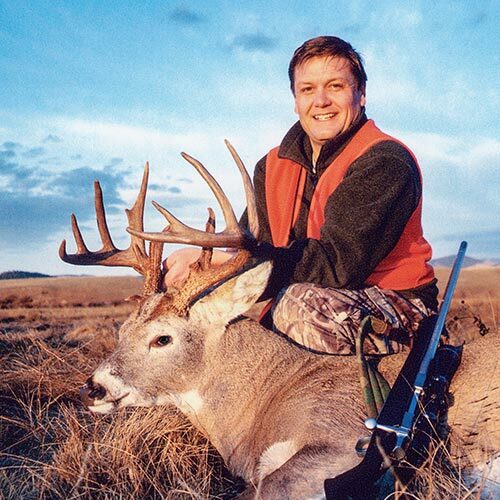 The later hunts produce some very nice bulls and offer great deer hunting. Many of the largest mule deer and whitetail bucks are seen and taken during the rut in mid/late November. We hold reservations after receiving a full deposit. Deposits for all hunts are non-refundable, but can be applied to other available dates or a replacement within the same year. Final payment is due on October 15th of the year you are scheduled to hunt. This is the 2019 licensing proposal as stated to us by the MT Department of Fish, Wildlife, and Parks. 17,000 Big Game Combination Licenses will be sold to non-resident hunters through a drawing process. You can apply for your license directly online. We will also send applications to booked and deposited hunters around January 20 if you prefer. Applications will need to be filled out, and with license fee enclosed, mailed back to the Fish, Wildlife, and Parks State Office in Helena before the March 15 deadline. No powers of attorney will be accepted. The 2019 Big Game Combination License fee is $1050.00 (tentative), and entitles you to fish, game birds, 1 deer, 1 elk, and a conservation number. *If you are unsuccessful in the license drawing, your deposit will be refunded in full immediately. Our camp offers enjoyment, relaxation, modern facilities, good cooking, professional services, references, magnificent scenery, and great hunting. We are booking the 2019/2020 seasons at this time. Please give us a call to book the dates that interest you. Thank you for your time and consideration. Our camp offers enjoyment, relaxation, modern facilities, good cooking, professional services, references, magnificent scenery and great hunting. We are booking the 2019 & 2020 seasons at this time. Please give us a call to ask about the dates that interest you. Please give us a call if you would like to receive a copy of our annual newsletter. © Copyright Avalanche Basin Outfitters, Inc.